OVERUNDERSIDEWAYSDOWN explores ceramics present currency within the art world and the reasons why it is of such interest to artists. 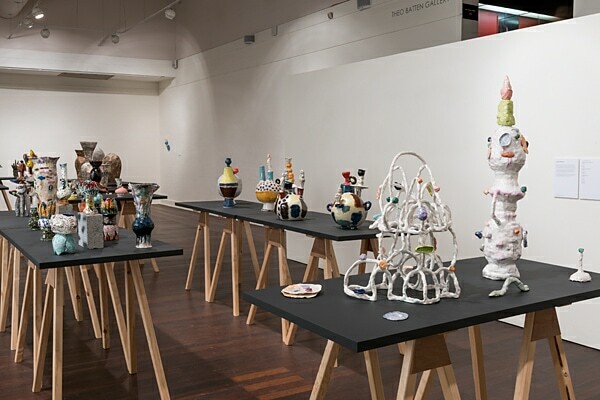 This exhibition excavates the foundations of this interest and brings together artists, some of whom have long careers with ceramics stretching back decades, and others whose engagement with it has irrevocably changed the way they work, what they make and how they make it. It collectively reenergises the ceramics community and brings it into new contemporary contexts. Participating artists include Stephen Baxter, Stephen Benwell, Angela Brennan, Lynda Draper, Trevor Fry, Emily Hunt, Rupert Jack, Rachael McCallum, Sharon Muir, Jenny Orchard, Madeleine Preston and Dawn Vachon.